(Retired) Senior Vice President and Regional Manager, Wells Fargo Bank, N.A. 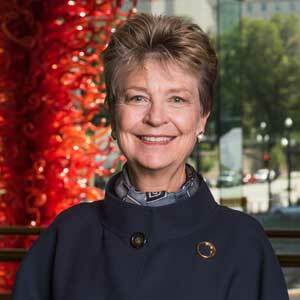 Patricia A. Richards is a Lifetime Trustee of the Utah Symphony | Utah Opera (USUO) Board of Trustees. Ms. Richards served as Chair of the Utah Symphony | Utah Opera Board of Trustees from 2005 to 2014 and additionally served as USUO Interim President & CEO from July 2015 to July 2016. Her further community service has included Chair of the Board of Governors of the Salt Lake Chamber of Commerce, Chair of the Board of United Way of Salt Lake, President of the Salt Lake Rotary Foundation, National Advisory Board of the David Eccles School of Business, Westminster College Board of Trustees, and Governor’s Economic Council. Ms. Richards served as Chair of the League of American Orchestras Board of Directors from 2014 to 2017 and has served as a panelist at several national conferences. In 2013 she received the National Opera Trustee Recognition Award from Opera America and the Governor’s Leadership in the Arts Award from the State of Utah. She received the Governor’s Lifetime Achievement Award at Utah Philanthropy Day 2014.